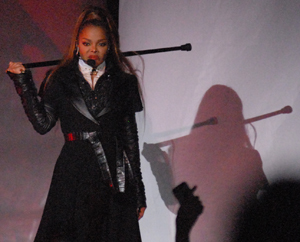 A member of pop music royalty was in Tulsa recently as Janet Jackson brought her “State of The World Tour” to the BOK Center, performing before an enthusiastic audience of all ages and earning praise as an extension of 2015’s “Unbreakable Tour,” which went on hiatus as Jackson gave birth to her son Eissa in January. As the house lights dimmed anxious fans stood on their feet and applauded as they anticipated the arrival of Jackson. They had to wait just a little longer as a video played on three large screens touching on recent events such as domestic terrorism, the killing of black men by police and right-wing extremists, while also condemning white supremacists. At one point Jackson exited the stage for a costume change, allowing her dancers to perform alone in the spotlight. When she returned she was dressed in black and red sweat pants, denim jacket and flannel shirt tied around her small waist and sat down on a stool as she performed “What About.” As the song came to close it looked as if her emotions got the best of her, as she briefly knelt on the stage. When she stood, she appeared to wipe tears from her eyes as she exclaimed, “This is me” which drew applause of support. For approximately two hours, the Tulsa audience danced and sang along with Jackson, putting recent events behind them and united as one. For that, we should be grateful. 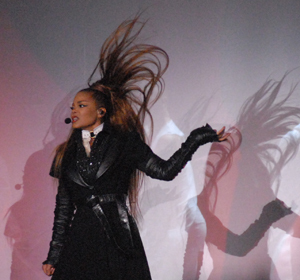 Click here for more from Janet Jackson’s “State of The World Tour.” Photos and story by Greg Duke, Tulsa Today. This entry was posted in Out & About on September 23, 2017 by admin.